Bus down the central market in Djibouti City. 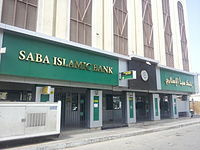 A Saba Islamic Bank branch in Djibouti City. ^ a b "Djibouti". International Monetary Fund. Retrieved 1 October 2014. ^ "World Bank forecast for Djibouti, June 2018 (p. 152)" (PDF). World Bank. Retrieved 11 September 2018. ^ "Ease of Doing Business in Djibouti". Doingbusiness.org. Retrieved 24 January 2017. ^ "Export Partners of Djibouti". CIA World Factbook. 2013. Retrieved 11 May 2015. ^ "Economy of Djibouti". 2014. ^ "China has no military ambition in Djibouti - Global Times". www.globaltimes.cn. Retrieved 30 November 2015. A government budget is a financial statement presenting the government's proposed revenues and spending for a financial year. The government budget balance, also alternatively referred to as general government balance, public budget balance, or public fiscal balance, is the overall difference between government revenues and spending. A positive balance is called a government budget surplus, and a negative balance is a government budget deficit. A budget is prepared for each level of government and takes into account public social security obligations. In economics, a country's current account is one of the two components of its balance of payments, the other being the capital account. The current account consists of the balance of trade, net primary income or factor income and net cash transfers, that have taken place over a given period of time. The current account balance is one of two major measures of a country's foreign trade. A current account surplus indicates that the value of a country's net foreign assets grew over the period in question, and a current account deficit indicates that it shrank. Both government and private payments are included in the calculation. It is called the current account because goods and services are generally consumed in the current period.